Open: When it comes to technology, open can mean many things to many people. In a survey of the various uses of the word ‘open’, Jeffrey Pomerantz and Robin Peek identified the following categories: open source, open standard, open access, open society, open knowledge, open government and open washing. In regards to badges, open can best be understood as relating to the agreed standards which provide the protocols to build the web upon. Badges: For many when we think about badges the idea of sleeves full of achievements sewed on comes to mind. Digital badges are best understood as a continuation of this. In this sense, they usually offer a way of gamifying a learning activity. Someone somewhere has deemed you worthy of a particular achievement standard. However, there is often little evidence to justify the outcome. You can find such badge systems built into platforms, such as WordPress.com, Edmodo, Class Dojo or Khan Academy. The intent of these is usually to both reward the user, but also entice you to go further. One of the limitations with digital badges is their lack of transferability and seemingly credibility. Outside of the context in which they are given, they lack purpose and meaning. In contrast, with the metadata baked in, Open Badges allow anyone to check their credibility, while more control is given to the receiver to show them. Standard: There are a number of standards associated with the web, including hardware, file formats and programming languages. In part, these allow users to access information from different browsers. Something that was not always possible in the early days of the web. Open protocols allow the creation of what are called ‘stateless’ RESTful APIs that help develop the web in a simple and efficient way. These interfaces make it easier to deliver content across the World Wide Web without the need to store sessions on servers somewhere. The Open Badges standard can be understood as a collection of specifications and applications that combines to make up the Open Badges Infrastructure. For badges, this means that different sites can talk to one another, therefore meaning that badges can be stored wherever you choose. The leading organisation in regards to the maintenance of such standards and specifications is the World Wide Web Consortium (W3C). In addition to understanding what the Open Badge standard is, it is important to appreciate the background to this idea and development of the standard over time. Initially developed by Mozilla with the support of the Macarthur Foundation, the beta version of the Open Badges standard was released in 2012. In 2014 the not-for-profit Badge Alliance was formed to keep work moving forward. With support and guidance from a number of organisations, the intent was to provide a stable centre around which the coordination of various working groups and weekly community calls could be done. In 2016, Digital Me combined with City and Guilds and Makewaves to take a more leading role in regards to the maintenance of the infrastructure. This has included upgrading the Mozilla Backpack, in particular replacing the Persona login system with Passport.js. In 2017, with the Badge Alliance being dissolved, the IMS Global Learning Consortium will take on the responsibility for continual development of the specification. This includes work around the involvement with Open Credentials. With their association with interoperability and attainment of technology in education, many see the nonprofit as the right fit moving to a more collaborative, community-driven effort. There has been some conjecture around the changes associated with Open Badges. However, Doug Belshaw argues that this is the usual dip associated with innovation. Using Gartner’s Hype Cycle, he suggests that it is actually important to go through a ‘Trough of Disillusionment’ in order to reach the ‘Plateau of Productivity’. In addition to the roles of the various organisations, there have been a number of steps in regards to the the development of the standard. The initial capacity made available in Version 0.5 was to bake metadata in single JSON file, as well as host and verify badges. The BadgeClass describes a particular defined achievement and points to the Issuer who defined it with its issuer property. An Assertion contains information about a single Recipient’s achievement of a BadgeClass and similarly points to the BadgeClass’s identifying ID with the “badge” property. The Issuer Profile is uniquely identified by a Linked Data ID (which takes the form of an Internationalized Resource Identifier, specifically a URI). This was done to provide more flexibility and use of information. In Version 1.1, the divisions were made even more explicit, with the addition of JSON-LD (for “linked data”) and three new properties: @context, id, and type. These components make possible a range of extensions, such as an application link, an endorsement, location information, accessibility details and recognition of the original creator. You can view examples of the code here. It should be noted, like all things new and open, just because functionality is added to a specification, it does not mean that everyone necessarily builds upon this. Rather it is often about what is possible and allowing for the diversity of the community. For more info on the development of Open Badges standard, go to the openbadges.org site. While for more details about the various the specifications, check out openbadgespec.org. Doug Belshaw has also started a curated slidedeck if you are looking for a list of those associated with Open Badges. There are many perceived benefits to Open Badges. The Badge Alliance identify four key aspects. Badges are free for anyone to use and build upon. They are transferable in that they are not dependent on any one platform. They are stackable as they offer the means of collecting together different accomplishments. While they incorporate evidence that is baked into the data. Approaching the challenge of hiring and the traditional curriculum vitae, Doug Belshaw discusses how Open Badges are granular, provide proof of achievement(s) and allow the earner to tell their story. They help people fill in the gaps to paint a better picture, as well as take back control of the way we trust one another. Coming from the perspective of assessment, Don Presant makes the case that Open Badges can provide the means for reinforcing self-directed learning. These links to learning are also elaborated in the results from the Design Principles Documentation Project (DPD Project) that arose out of the initial HASTAC funding associated with Open Badges. 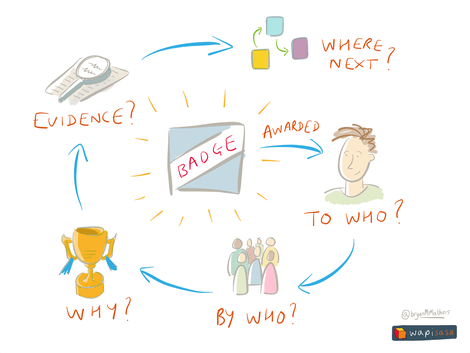 The project identified four categories of learning to help think about badges. They are recognise, assess, motivate and study. Associated with the research, a number of resources were developed, including a series of cards designed to help develop your own system. Another useful planning resource is the Open Badge Design Toolkit created by Grainne Hamilton. For a different introduction to Open Badges, the Chicago Art Department has created a useful video highlighting a range of the benefits, while HASTAC has collected together a number of voices on the topic. Whether it be high or low stakes learning, badges offer a flexible form of micro-credentialing that is really up to your own imagination. Doug Belshaw captures this with a continuum which spans the formal to the interesting, while Serge Ravet presents a plane of recognition encompassing the formal and informal, as well as the static and dynamic influences. Going a step further, Ilona Buchem has developed a taxonomy around the different intents, revolving around content, issuers and process. To provide a comprehensive picture, she unpacks each providing various examples to show the different possibilities. This is neatly captured in Bryan Mathers’ graphic. Another way into Open Badge is to consider them as a substitute for a traditional certificate with built-in breadcrumbs baked into the code. Where they differ from certificates is that badges are often a part of an ecosystem. Although they can be created individually, their potential lies in the ability to be interconnect and provide different pathways for learning. The most obvious pathway is the stepping stones approach. Sequential in nature, this involves completing one step at a time in a prescriptive manner. See for example, Doug Belshaw’s kanban badges using Trello. Another option is where badges are a part of a collection. Like the game Trivial Pursuit, this is where several achievements are grouped together in a nonlinear manner. Prescriptive in nature, collections can be linked with the completion of standards or levelling up. 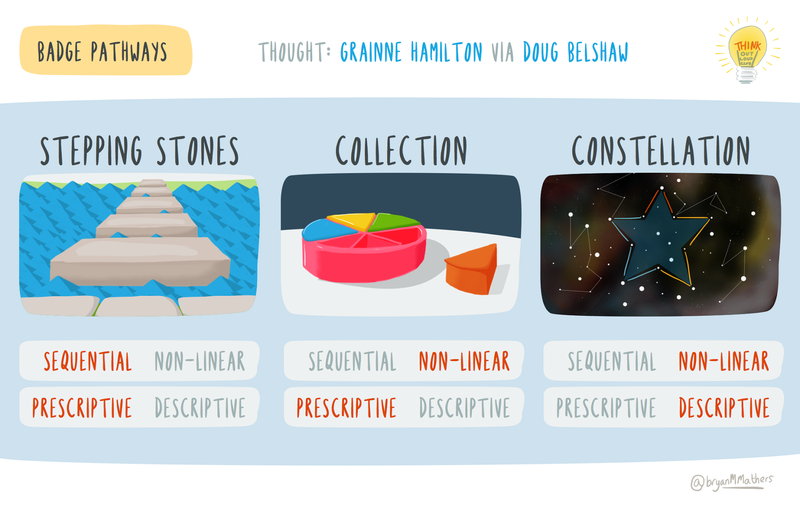 In contrast to perspective badge ecosystems, constellations offer an open-ended approach where users can choose from a range of possibilities, carving out any number of pathways. 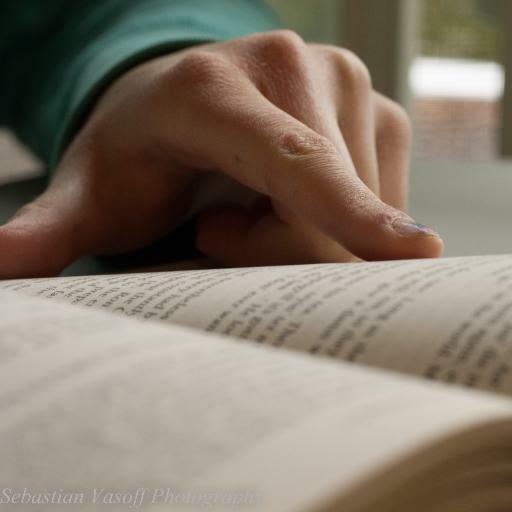 This is conducive to lifelong learning and offers the potential to collected together different achievements to write your own learning story. Open to borrowing from different providers, it is for this reason that it is descriptive rather than prescriptive. Reflecting on the place of badges, Greg McVerry suggests that they only play one part of the story and that credentials and qualifications are often verified by presence. In part this is what sites like LinkedIn try to tap into allowing people to endorse various expertise. There does seem to be some attempt to bake this information into the code with the addition of Extensions in the move to JSON-LD. 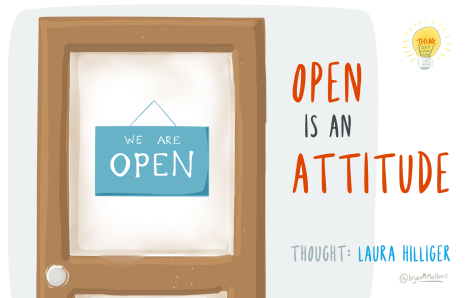 In regards to examples, there are a number of case studies shared within the Think Out Loud Club’s Open Badges 101 Course, while Don Presant demonstrates how Open Badges could be used to credential self-directed learners. Although there are those, such as Todd Rose, who talk about rethinking learning around capabilities, credentialing and self-determined learning. Such discussions either ignore the underpinning infrastructure or simply fail to recognise such changes. In regards to Open Badges, there are a number of steps involved, including the platform used to issue badges, the evidence referenced in the process, the creation of the actual digital badge and where badges are stored. When I first came upon Open Badges, it was via Peer 2 Peer University. What was good about P2PU was the ease in which you could create a badge. In addition to this, there were a few useful features, such as the ability to add different forms of evidence to the site, as well as the potential to distribute responsibility for credentialing others to everyone in the community. The problem though is that P2PU did not nessarily make it easy to take my badges elsewhere. This is one of many things to consider when working with open standards and open source software. Does the platform allow you to store badges? Does the platform include the ability to create the visual design of the badge? Does the platform allow for multiple badge-issuing? Does the platform allow badge earners to export their badges to other providers? Does the platform attempt to lock me in if I want to move between badge issuing platforms? Does the platform use Open Source technology? Does the platform allow you to add evidence? Does the platform provide a means for submission and notification? Badgr: Relatively easy to use once you get your head around the workflow, Badgr provides a structured way to allocate badges. Like many platforms, it allows you to not only issue badges, but also bring them together into various collections. The problem faced is when it comes to notifications, while the evidence is required to be housed elsewhere. 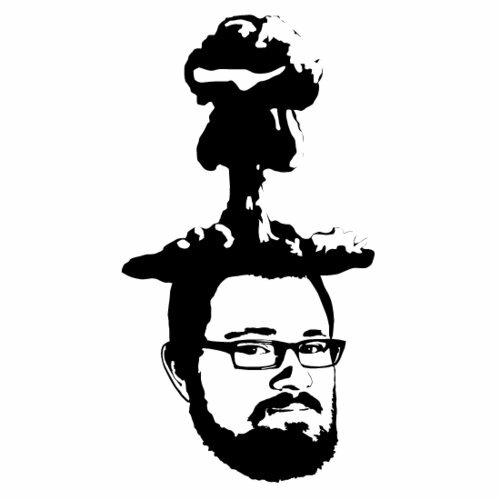 Being open sourced, one of the big potentials is to run your own instance. Credly: In some ways Credly is to Open Badges what Medium is to blogging. It provides the means to both issue and receive badges, while it has incorporated almost all of the options associated with Open Badges standard, such as tags, categories and the submission of evidence. There is also the ability to add content, such as images and text, directly within Credly. In regards to creating your badges, Credly makes use of the icons via The Noun Project. While when it comes to issuing, there is the option of issuing badges to more than one recipient at once using a CSV file. If you are using Google Forms and/or Sheets then you simply download them as CSV. While once issued, badges can be grouped into lists and then referenced elsewhere. Although much of the functionality is available via the free account, there are various premium options which allow things like analytics, verification and the use of your own domain. Open Badge Academy:Similar to Credly, Open Badge Academy provides the means to quickly and easily create and curate badges. One of the unique features is to develop a sequence of tasks, incorporating a range of media. Designed around the idea of organisations, provides a number of ways to brand your badges. It is one of the most visually appealing platforms and seems to make sense as a user. However, the limit of three badges for the free account means that to be meaningful, you have to pay. This is only a selection of some of the spaces. The Badge Alliance has curated a comprehensive list of platforms (although it does not include Open Badge Academy.) It needs to be noted that being an open standard also provides the possibility and potential to build your own solution hooking into the various APIs. For ideas on this, see the work of Martin Hawksey for inspiration. 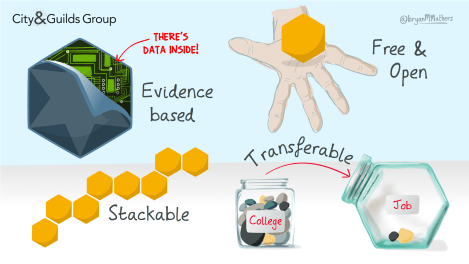 One of the biggest differences between badges (and digital badges) and Open Badges is the nature of the evidence. Too often formal learning is measured by a grade or a number, while professional learning is quantified in hours. None of this is attached to either meaningful or personalised evidence. Open Badges sets out to resolve this by adding verification into the process. Anything that you can put on the web associated with a link can be used as evidence. The challenge with this is that not every link on the web is accessible. For example, you may wish to link something shared within a closed community. However, unless the person issuing the badge is also in that community this will not work. In addition, anyone who may wish to verify the evidence in the future will be unable to do so unless they too have access. It is in part this reason that Doug Belshaw recommends creating a canonical URL. That is, a starting point for people to engage with and build upon your work and ideas. Something of an eportfolio developed over time or separate links for each project. What matters though really is that it is public and open. Padlet: A digital pinboard that can be useful for capturing a range of media files. G Suite: Maybe it is Docs or Slides, but the cloud based nature of Google means that it is easy to share out. OneNote: Like a Google Apps, OneNote allows you to collect a range of content in the cloud and share out. Adobe Spark Page: An easy way of quickly making a website in which to share links, images and text. Canva Website: Like Spark Page, Canva now offers the ability to quickly and easily create a website. Slideshare: A space to upload and share presentations, whether it be a PowerPoint, PDF or Google Slides. Storify: An application which allows you to easily curate a wide range of content. Blog: Whether it be in the form of a post or adding content to a static page, blogs offer an easy means to collate content in one space. GitHub: Although this involves a bit more effort, GitHub provides the means of creating a static site or a repository, especially using something like Jekyl. Docs.com: A space to share Microsoft Files and resources. A compromise for those who do not wish to share openly is to use an application which allows you to share with those who have the link. Whatever space you use though you need to be mindful that sites can come and go, therefore the most powerful option is often one which gives you control over the lease. Although most sites provide the potential of creating visual badges. It can also be useful to create and store these elsewhere. You only need to look badges up on Google to find a range of options, including Makebadg.es, Canva and OpenBadges.me. The catch is often what information these sites are asking for in return, such as the requirement to sign up in order to download. A simple option is to use Google Drawings to create badges. Cropping shapes and then saving the image as a PNG to maintain transparency, Drawings offer a quick and easy solution. You can also easily edit them again at a later date. Alice Keeler has documented this process, as well as a simple process of awarding digital badges using G Suite that could be useful as a minimal viable product associated with badging. Whatever platform you use, it is important to be mindful of Creative Commons licensing when choosing images and icons. Sites such as Flickr and The Noun Project provide a wealth of options to use. Otherwise Tony Vincent shows how to use Google Drawings to create your own. Once you have been issued a badge, the next question is what you do with them. This includes considering where you store them, how you organise them and where you show them. The first thing to decide is where to keep your badge. Many platforms allow you to and encourage people to store badges with them. With this in mind, you need to wary that not all platforms provide the same portability as others. Another option is the Open Badge Passport. The sister product to Open Badge Factory, this site allows you to collect your badges, as well as easily share them on social media such as LinkedIn, Twitter and Facebook. The reality is that both platforms allow you to organise your badges. This is useful in creating a link for presenting them elsewhere, whether it be within your LinkedIn profile or in the signature of your email. 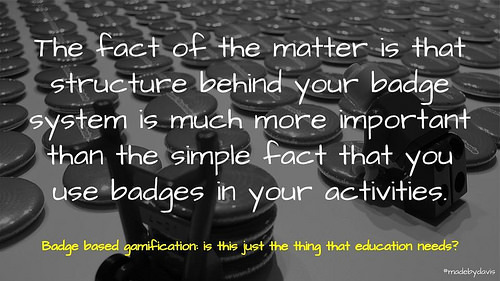 It can be easy to get excited about technology such as Open Badges, but a badge in itself will not transform education. It is therefore important to be mindful that badges may not be for everyone and should therefore maintain a voluntary element, as Martin Hawksey warns. Also we still need to be wary when it comes to the criterias we set and the evidence we provide. For as Alan Levine has shown, quality is not always a given. Ale Armellini questions the benefits altogether. Whatever choices that we make, it is important that they are situated within a wider debate about digital literacies and education. So what about you? What have been your experiences with Open Badges? Do you have any thoughts to add to the discussion? As always, comments welcome. A Comprehensive Guide to Open Badges by Aaron Davis is licensed under a Creative Commons Attribution-ShareAlike 4.0 International License. -Open Badge Passport can also be a portfolio – it can store badges, files and links and you can embed videos and curate with text. You can use Passport Pages as evidence for badges, before or after earning them. -Thanks for the citation, but my name is Presant, not Peasant – you’re taking me back to grade school when you call me that! Thank you Don for your comment. I look forward to see what v.2 has to offer. In regards to Open Badge Passport, thank you for clarifying some of the differences between Mozilla Backpack. That is useful to know. Interestingly, it would seem that most sites integrate with Mozilla, can the same be said for the Passport? About the name, I should know better. People often drop in an extra e to Davis. Hi Aaron, no problem about the name! If when you you say “integrate with Mozilla”, you mean display badges from Backpack, then Passport essentially uses the same display protocol from the OBI as Backpack. In addition, Passport offers iframe embed code that can be used on Google Sites, for example. The Mahara ePortfolio displayer can display Passport badges in addition to Backpack ones. Just a few examples.